USAID offer to people for exciting career opportunities in industry sector. USAID authority think that young and energetic people is the key to success in this sector that create brightness in our country. Otherwise,USAID help’s us to social economy. If you want to apply for this job,you should submit your application within short time. 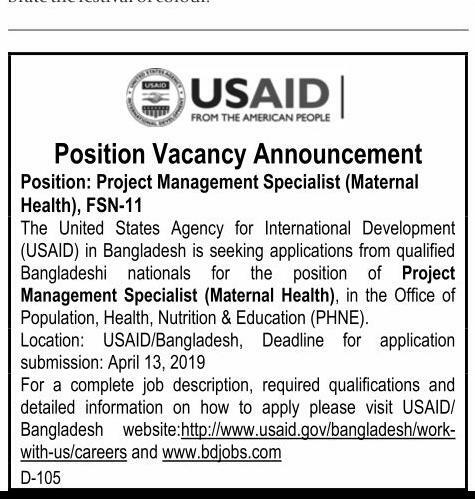 USAID original job circular converted to an image file,so that everyone can read easily or download this job circular. USAID Job Circular 2019 has been given bellow. Yes I agree and suggested it. I wish visit this web side and like it. vai kindly amake krishi bank ar data entry oparetor written exam question 2018 apnar kache thakle patan. amar KB te same exam 27/04 /2018 ami pattren ta dhebo. This is a helpful post. Thanks, Admin for providing update jobs circular.